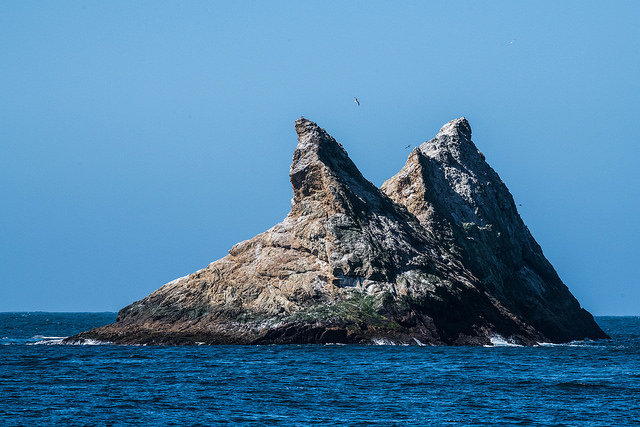 We started off on our Farallon islands trip with better weather than forecasted. As usual, we headed north along the coastline for a while before we headed west towards the islands. As we reached Stinson Beach, the crew spotted a whale. It turned out to be a gray whale covered in sea lice, much of which was pinkish. We floated and waited for the gray for a little while. It was surfacing several hundred yards from us. As I was scanning the opposite direction, another whale popped up with a relatively large dorsal fin. Gray whales have no dorsal fin at all, so there's no chance it was the same whale. This whale was smaller and the dorsal fin was tall and curved. There was no visible blow. Based on this information I identified it as a Minke whale. We did not see it surface again. After a few minutes of staying with the elusive gray whale, we decided to continue on to the islands. The weather stayed relatively nice until about 5 miles from the islands, where the wind picked up quite a bit. The islands were covered in nesting common murres, and there were many in the water as well. We also saw California and Steller sea lions and a few elephant seals. There were lots of birds in breeding plumage. On our way back from the islands, we saw some more sea lions and some harbor porpoises, but did not find any more whales. California sea lions resting on a shipping lane buoy. Passenger Yi Lu took some great photos as well. I featured a few of my favorites below. Check out the whole album here and follow him on Instagram for more photography.